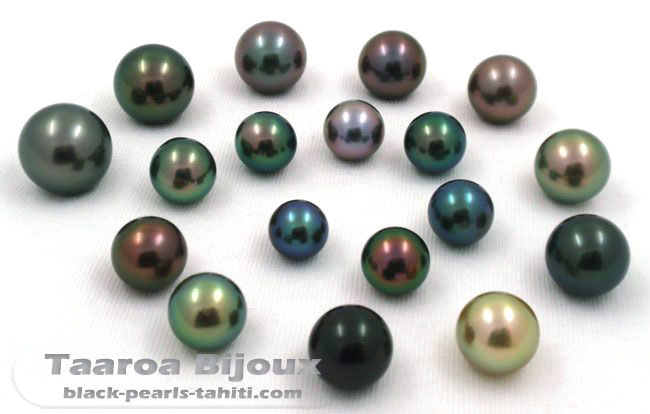 The Tahitian Pearl is dense, and is somewhat shock-resistant, but it can be scratched through contact with other jewelry. Therefore, we advise you to wear only your pearl on a chain, and to place it in its own jewelry box when you are not wearing it. To keep its original shine, avoid chemical products such as shampoo, soap, perfume, and chlorinated water from your faucet. Remove your pearl jewelry before bathing. If you play a sport during which you perspire, it is better to remove your pearls, because some acid perspiration can alter the shine of your pearl. After wearing your pearl, you can simply clean it with a soft cloth which may be moistened with non-chlorinated water. We advise against coating your pearl with coconut oil or olive oil, as we have seen suggested, because this would only cause dust to stick to it. The most important thing to know is that the Tahitian Pearls contain 2% water. It is very important that this water remains in the pearls to avoid serious changes. Therefore, do not place your pearls in direct sunlight or in front of a window. If your home is air conditioned, leave your pearl in the bathroom when you're not wearing it. Do not leave your pearl in a wooden box (dehydration) and especially not in a plywood box (formaldehyde). If you will not be wearing your pearl for several months, and you will be storing it in a place which lacks humidity, place a glass of water next to it. The best idea is to wear it regularly, because the contact with your skin will rehydrate it, and help to preserve its beauty. By following these simple logical suggestions, you will enjoy the beauty of your pearl for many years.